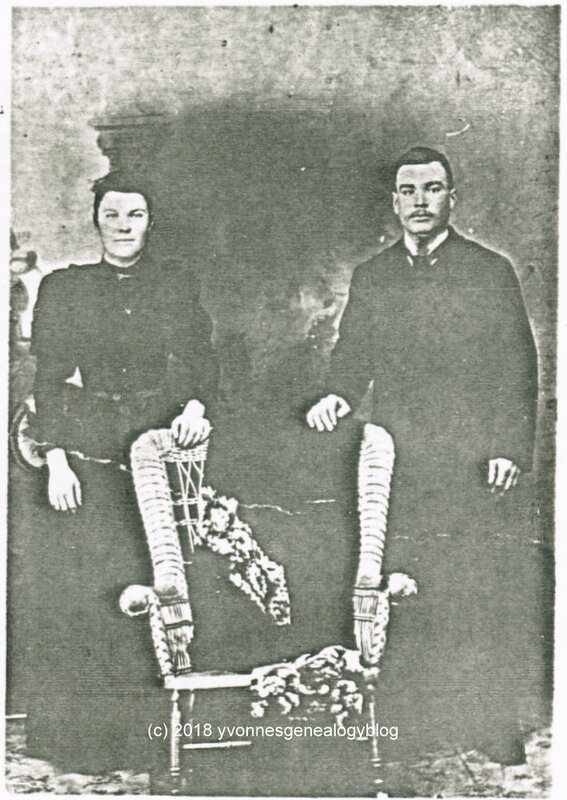 My maternal great-grandparents Joseph Beauvais and Olivine Hotte were born in Papineau County, Quebec – he in Ripon and she in nearby Hartwell (now Chénéville). They married on 16 August 1897 in Chénéville. Joseph and Olivine were the parents of 16 children: 12 sons and 4 daughters. Joseph was a bûcheron (a woodcutter, timberman or a faller) and that’s probably what led him to move his young family to Tupper Lake in New York State, an area known for its lumber production. His second son Oscar was born there in 1899. The Beauvais family lived in New York for one or two years, before they returned to live in the province of Quebec. 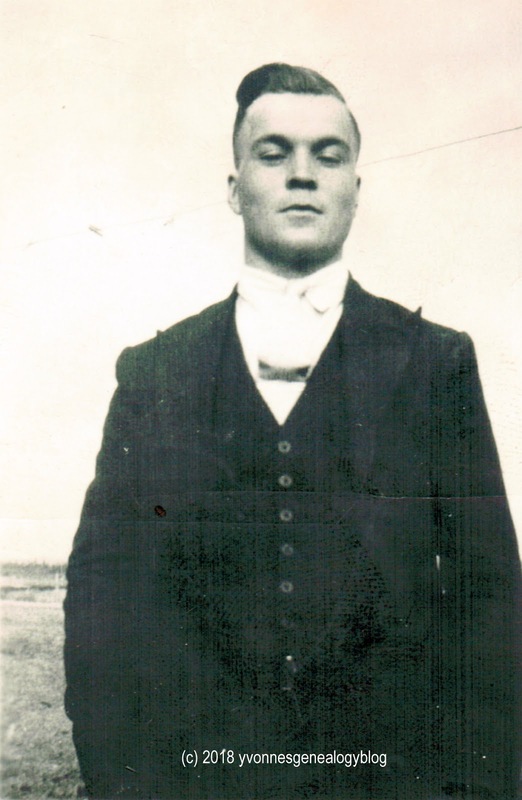 About 1923, Joseph and his family moved to Moonbeam, a village in northern Ontario. Olivine died there soon after on 4 June 1926. Joseph died on 17 September 1937, also in Moonbeam. 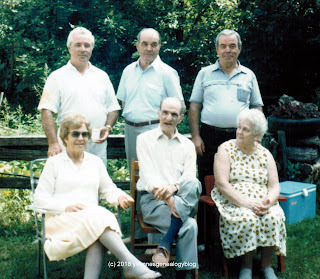 I knew some of my mother’s aunts and uncles, like Réal and the three youngest ones. When my family was on holiday in Ontario and Quebec in 1986, we visited Gatineau (across from Ottawa in the province of Quebec) and met Réal (Mom’s godfather) and his wife Stella. While there, we visited Jean-Marie and spent a lovely afternoon at his home. His twin brother Jean-Paul was there, so I met him, too. As for Laurette, I knew her from our occasional visits to Moonbeam where she lived. (Moonbeam is about 1½ hours north of Timmins where my family lived.) 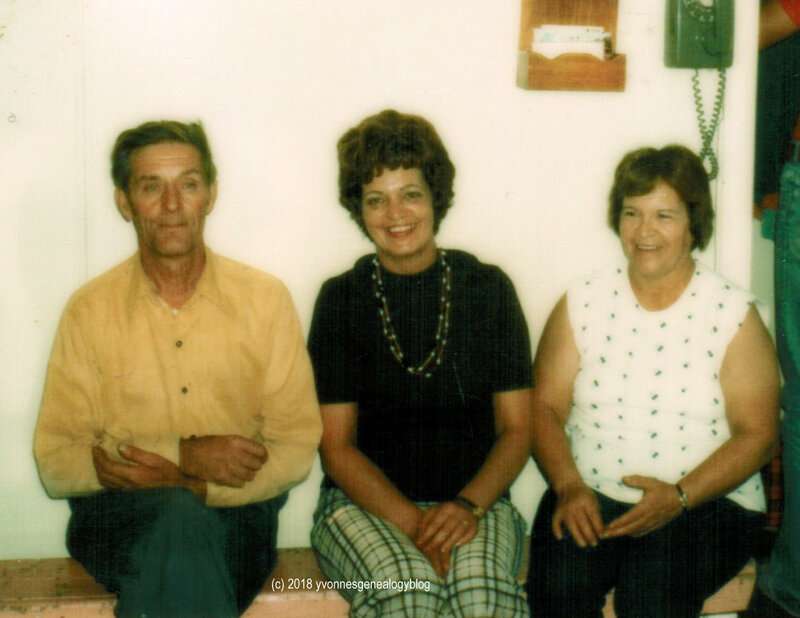 After we moved to British Columbia in 1979, we rarely saw Mom’s Beauvais relatives. We really appreciated that Aunt Madeleine, Mom’s sister, who lived in eastern Canada, kept us up-to-date with news about their relatives. Ovide was born on 8 June 1898 in Chénéville. On 7 June 1920, he married Lucienne Duchesne in Sturgeon Falls, Ontario. They had 16 children. In 1941, Ovide and his family moved from Sudbury and settled in Blue Water, a village that no longer exists near Sarnia, Ontario. He died on 12 July 1981 in Sarnia. Oscar was born on 25 November 1899 in Tupper Lake, Franklin County, New York, USA. He married on 5 October 1922 in Montpellier, near Chénéville, Rosa Robillard. They were the parents of 14 children. Oscar and his family later settled in Blue Water like Ovide and Juliette. Oscar died on 4 July 1979 in Sarnia. My grandmother Juliette was born on 30 June 1901 in Chénéville. On 18 August 1925, she married Eugène Desgroseilliers in Moonbeam. 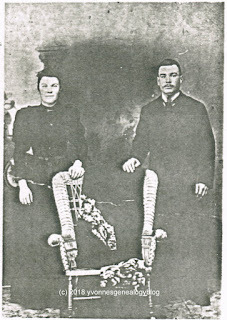 Juliette and Eugène, who had nine children, lived in northern Ontario and northern Quebec, where he was a chief of police. In 1942, they settled in Blue Water like her brothers Ovide and Oscar. Juliette died of pancreatic cancer on 14 August 1948 in Sarnia, Ontario. Eugène’s brother Ovide Desgroseilliers married Juliette’s sister Laurette (Lorette) Beauvais. I wrote about Juliette and her sister Agathe at Sibling Saturday: Juliette and Agathe Beauvais. Marie-Louise was born on 30 January 1903 in Montpellier. She died on 26 May 1947 in hospital, possibly in Kapuskasing, Ontario. Marie-Louise was unmarried. About 10 years ago, her niece, my Aunt Madeleine, told me that Marie-Louise had been in love with one of her sister Juliette’s brothers-in-law, either Arthur Desgroseilliers (1901-1923) or Hormidas Desgroseilliers (1906-1934). Unfortunately, both brothers died young and unmarried. Aldège was born on 16 August 1905 in Montpellier. In January 1940, one of Aldège’s horses kicked him in the face. He died from complications from his injuries on 2 February 1940 in Montreal, Quebec. Aldège was unmarried. Léger was born on 4 January 1907 in Montpellier. On 26 February 1935, he married Rollande Filion in Cochrane, Ontario. They lived in Moonbeam and were the parents of 14 children. Léger died on 6 September 1992 in Moonbeam. Romuald was born on 16 March 1908 in Montpellier. He married Bernadette Dubosse (Dubosq) on 22 November 1944 in Moonbeam. They had four children. Romuald died on 5 November 1991 in Kapuskasing. Emile was born on 7 April 1910 in Montpellier. On 15 July 1947, he married Claire Bourgeois, a schoolteacher, in Val-Rita, Ontario. The couple had four children. Emile died on 28 July 1990 in Hearst, Ontario. Martial was born on 17 September 1911 in Montpellier. He married Marie-Paule Marin on 3 July 1948 in Moonbeam. They had seven children. Martial died 18 August 1982. The cause of death was a vehicle accident, according to the coroner’s report. Réal was born on 26 January 1913 in Montpellier. On 15 August 1936, he married Stella Moisan in Val d’Or, Quebec. The couple had 16 children. 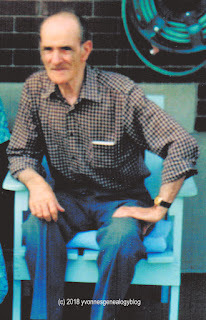 Réal died on 29 September 1997 in Gatineau. 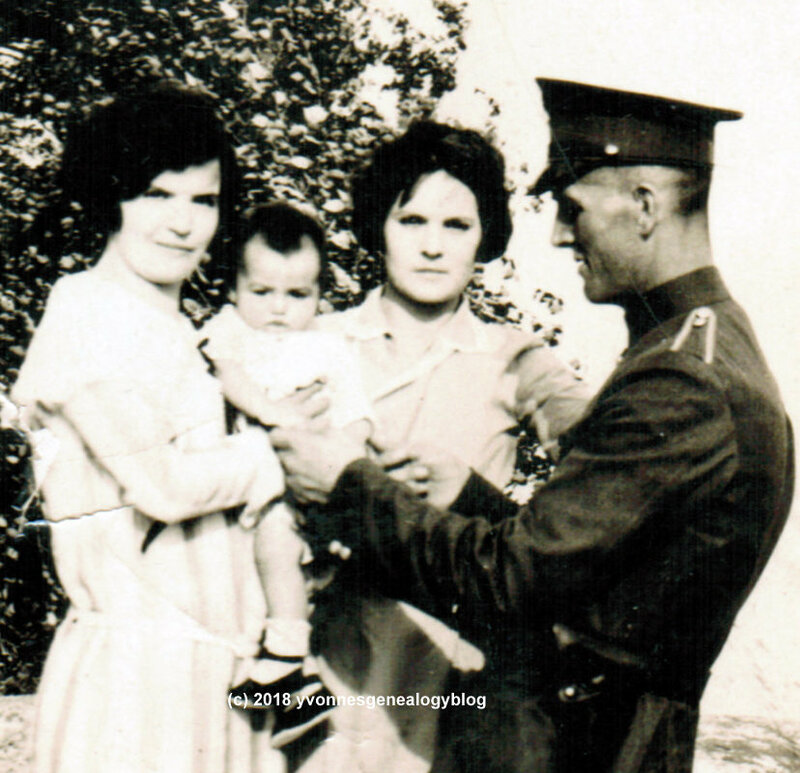 Réal and his younger sister Agathe were godparents to their niece, Jacqueline Desgroseilliers (my mother), at her baptism in 1933. Aurèle was born on 6 June 1914 in Montpellier. He married Florence Carrière on 12 May 1942 in Moonbeam. They had four children. Aurèle died in 1996 in Hearst. Joseph was born on 22 August 1916 in Montpellier. On 22 November 1939, he married Germaine Girard in Moonbeam. The couple, who had six children, lived in Val d’Or. Joseph died there on 6 March 2003. Agathe was born on 3 March 1918 in Montpellier. She and her elder brother Réal were godparents to their niece, Jacqueline (my mother), at her baptism in 1933. Agathe married Lucien Larouche on 25 March 1940 in Val d’Or. They had eight children. Agathe died on 30 December 1956 in Val d’Or after giving birth to a son earlier that day. Her niece, my Aunt Madeleine, said her death was due to a blood clot. My Mom Jacqueline was visiting her when they got the news of their Aunt’s death. I wrote about Agathe and her sister Juliette at Sibling Saturday: Juliette and Agathe Beauvais. Laurette (Lorette) was born on 9 August 1919 in Montpellier. She married Ovide Desgroseilliers on 9 September 1936 in Moonbeam. They had seven children, all boys, and lived in Moonbeam. Laurette died on 24 April 1995. Ovide’s brother Eugène Desgroseilliers married Laurette’s sister Juliette Beauvais. Jean-Marie and Jean-Paul were fraternal twins. They were born on 1 May 1921 in Montpellier. Jean-Marie married Huguette Larouche on 5 July 1948 in Val Senneville, Quebec. They lived in Gatineau, Quebec and were the parents of four children. Jean-Marie died there on 20 December 2010. Jean-Marie and Jean-Paul served in World War II. Jean-Marie was posted at CFB Chilliwack, British Columbia for a time. 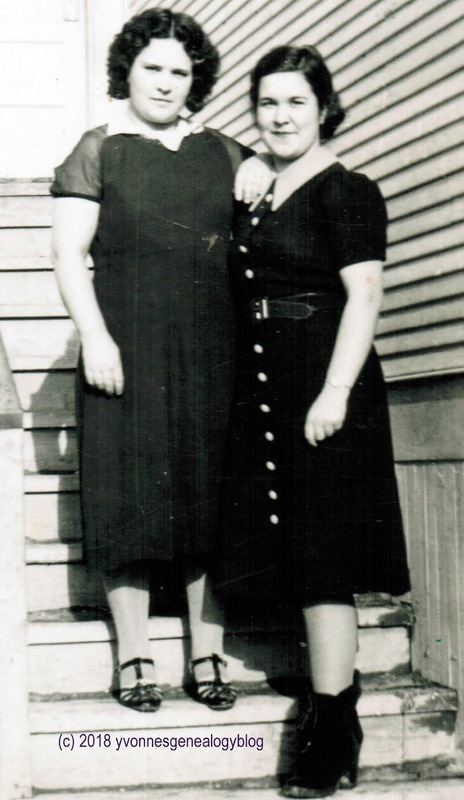 On their leave, the twins visited their eldest sister, my grandmother Juliette, at home in Blue Water. Mom said Juliette loved her brothers and was close to them even though there was a 20-year gap between them. Uncle Jean-Marie lived for a brief time with my parents and our family in the early 1970s. He was a sales rep for Filter Queen vacuum cleaners and came to Timmins to recruit my father as a salesman. I can still see Uncle Jean-Marie sitting in our living room on Main (now Bélanger) Avenue talking to someone on the telephone and asking for a French operator. He believed that since Canada was a bilingual country, the phone company ought to find him someone who spoke French. I'm pretty sure he succeeded, too. Jean-Paul and Jean-Marie were fraternal twins. They were born on 1 May 1921 in Montpellier. On 12 September 1959, Jean-Paul married Pauline Ennis, a widow, in Montreal. He died in 2002.